Looking for that white elephant gift or just want some awsome-in-a-can? 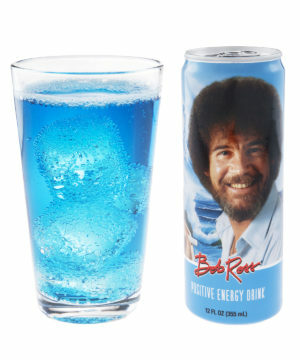 Enter the Bob Ross Positive Energy Drink ($4 per 12-ounce can). Each can of Bob Ross Positive Energy Drink is 12-ounces of a mixed berry flavor that includes ginseng, guarana, B Vitamins, and 100mg of caffeine. Go ahead, get your credit card out and head here for a 12-pack of awesome.